Ancient Greeks during the time of Homer poured liquids into large, decorated funerary vessels placed over graves — perhaps not to sustain the dead but as an act of remembrance. Tall, near-anthropomorphic kraters with holes at the bottom allowed libations to seep directly into the ground. Their function was not to hold but to momentarily contain. On the surface of an exemplar of this type, a three-and-a-half-foot vessel (now housed at the Metropolitan Museum of Art), figures are abstract and shadowy, as vague as memories. Though separated by a gulf of more than two millennia, Elizabeth Lide’s Putting the House in Order reminds me, oddly enough, of this ceramic krater. Dealing with a lifetime of inherited things is Lide’s titular concern for Putting the House in Order. In her statement, she describes feeling both the burden and solace heirlooms provide. It seems relevant, too, that we (in the West, but certainly not only) own so many things. Of course, the relationship of humans to objects has reached a consumer-driven crescendo, the roots of which extend back to the Industrial Revolution. Though relevant, such notions and their attendant politics are not foregrounded in Lide’s show. Instead, it is pervaded by deep nostalgia that is close to mournful. Putting the House in Order blends two-dimensional abstraction with objects, video and sound. Perhaps the most novel of these is a sound piece by Paul Kayhart that can be activated by opening a record player that Lide’s father had built. It plays nature sounds — birds, insects and rain, for example. It’s inspired, like much of the exhibition, by something from the past: her father made the device when Lide was a child. Despite her inclusion of such unconventional media, much of the exhibition consists of geometric abstraction on paper and fabric. The straightforwardly titled Graphite, paint, paper pulp on handmade Kozo paper from the Philippines, combines thick pulp with thin, translucent paper. The result is an understated attention to paper dimensionality — or to put it another way, the objectness of paper. Stitchery consists of aged quilting squares and embroidered pieces of fabric still stretched through wooden hoops as if in mid-process. 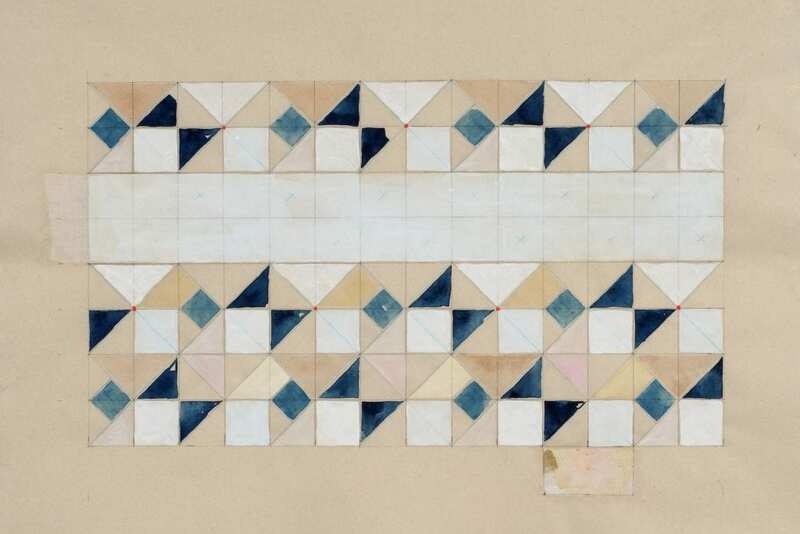 Like her works on paper, the imagery tends toward the simple and geometric — stitched circles and grids. Lide describes her iconography: circles indicate inclusivity and eternity, and grids suggest regulation and order. Occasionally, a timeworn garment hangs on the wall, unidentified and unlabeled. 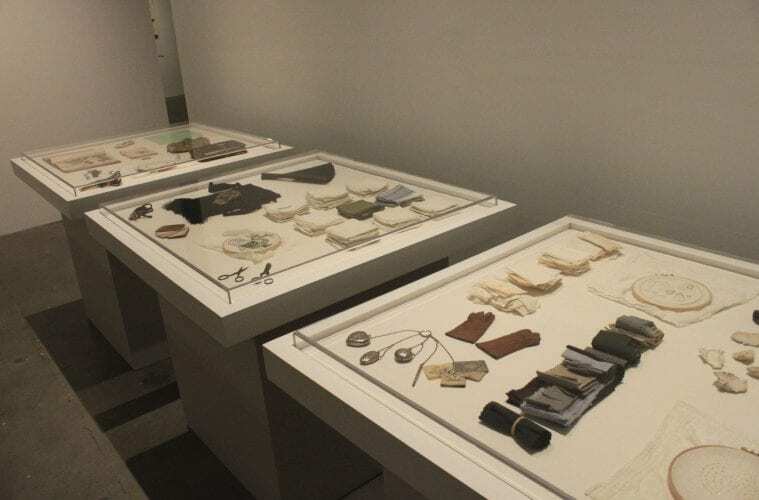 Display cases in the middle of the space house relics that read as heirlooms: lockets, stethoscopes, gloves, scissors, fans, hair and old fabric. It is clear that these things are old and important, but there’s also a frustrating lack of clarity as to what these things actually mean. In her statement, Lide describes her father’s practice of collecting old fabric patches or the significance of passed-down clothing, but there is no didactic wall text or labels to identify and specifically contextualize them. (Lide’s statement is required reading to glean meaning from these items!) Often, the relationship between a stained piece of cloth and a nearby work on paper seems strictly formal. Likewise, titles — mostly given to more conventional works on paper — are dry records of materials used. But there is an intuitive logic to Lide’s evasive titles and peculiar system of order. To me, it suggests that at best a handed-down object becomes abstracted artifact, a reminder of an absent relative. More often, and perhaps inevitably, the meaning of the once-precious thing is irrevocably lost. Its significance becomes its novelty and aesthetic appeal. Inherited objects, old clothes, clumps of saved hair may remind us of the past — but incompletely. One of Lide’s standout dealings with this theme is an installation of vases gathered underneath a looping, silent video. Edited by Lide from her family’s collection of 8-mm home movies, the images show a table set for the holidays, airplanes preparing to take-off, marshy landscapes, sunny beaches and so on. People come and go. The vessels below are replicas of family valuables. Made of paper and plaster, they also integrate scraps of clothing and hair from Lide and her family as if to suggest the integration of new lives and memories. Of course, the ersatz vessels — some split open so as to render them functionally useless — are as illusory as the fleeting images above. They are copies of the real things, mere stand-ins that suggest the failure of images and objects to truly restore the past. Lide’s show addresses a very basic impetus to make and look at art: its capacity to be succor to both artist and spectator. Driven by such catharsis is Lide’s most commanding installation: a wall of 180 pieces of bronze-colored paper, each decorated with a simple gray circle mid-page, reminiscent of the sun low on the horizon. Arranged in vertical rows, they are repetitious but marked by subtle differences. The bronze tint varies from pale copper to a dark, leathery brown, and the circles shift in size. Each drawing seems simple on its own, but it has a monumental quality as a whole, suggesting the passage of time, the way days accumulate into weeks and then years. In her statement, Lide discloses that the paper was made by a close friend who died in 2007. Thus the drawings read as simple acts the artist undertook to deal with loss. Perhaps like the ancient Greeks who poured liquids into an open-bottomed krater, such an act is a ritual of remembrance. It does not offer answers or restore what’s lost, but it provides momentary solace.